An artist's depiction of Europa Lander at work on the surface of Jupiter's icy moon. There's a stark difference between knowing that the conditions for life exist and actually finding some form of life, and that difference is at the heart of the Europa Lander mission concept that NASA could one day send to Jupiter's moon. 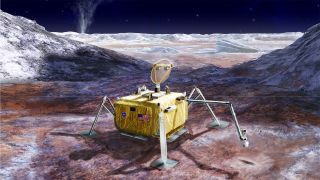 Once proposed to fly with NASA's planned Europa Clipper mission, which is due to launch as soon as 2023, the lander would now be its own separate successor spacecraft, assuming NASA decides to sign on. But access to the icy surface of the moon would offer scientists a much more powerful analysis of a world that they consider one of the most tantalizing prospects for finding extraterrestrial life. "You can do habitability pretty well from Europa Clipper, but if you actually want to look for biosignatures, if you want to look for signs of life, you've got to touch the surface," Cynthia Phillips, a planetary geologist at NASA's Jet Propulsion Laboratory in California, told Space.com last month at the annual Lunar and Planetary Science Conference held in Texas. In hopes of getting just that opportunity, scientists are already thinking through which instruments should be on board and how they would identify signs of life. Such a mission could follow behind the Europa Clipper mission, using its data to find a promising landing site. Once it arrives, the lander would be prepared to dig about 4 inches (10 centimeters) into Europa's icy shell in order to sample material that hasn't been fried by the harsh radiation environment around Jupiter. Then, the hard part begins: analyzing that ice in just the right way to determine whether there's anything alive on Europa. "We don't have a single way of detecting life," Phillips said. Instead, the team needs a broad suite of instruments, including a microscope, a seismic package, a camera and a host of devices for chemical analysis. But making sure all of those different instruments can work together is tricky. "The instruments are really the biggest challenge," Phillips said. "What happens when those samples are ingested into the instrument vault? How are those samples processed, do they have to be kept cold and frozen, do they have to be melted, do they have to be concentrated or filtered?" That's the team's focus this year. But the scientists and engineers aren't sure whether NASA will keep them at work on the project. "We're at the stage where NASA's considering how it fits into their budget priorities," Phillips said. "We don't have any idea if there's going to be funding in the future for it." Of course, she's biased in the project's favor, and in Europa's as well. "It's my favorite place in the solar system," Phillips said. And finding life there could be among the most profound discoveries possible, she argued — much more profound than finding life on Mars would be. "Mars, it's an old, cold, dead kind of world, so any life on Mars, we're probably looking for old, dead, fossilized life, life that survived 2 billion years ago when Mars was warmer and wetter," Phillips said. "When we talk about life on Europa, we're talking about the potential for life that's living there today, that's surviving, that's thriving, and that's really exciting." And whereas Mars is close enough to potentially be contaminated by Earth, Europa is not. "If we find life on Europa, that's life 2.0; that is not just one but two origins of life in our solar system," Phillips said. At such a great distance, there's no chance it's contamination from Earth. "If life can start not just once but twice in our own little solar system … there's life out there, there's got to be, and that right there, I think, is the revelation that's going to change everything. It's going to change our whole conception of how we fit into the galaxy."